Korea Information Blog: -Dokdo Ad on WP-We are moving to get the truth back from the World! -Dokdo Ad on WP-We are moving to get the truth back from the World! This is the Advertisement that over 94000 Korean people on Internet have gained to publish on the Washington Post. 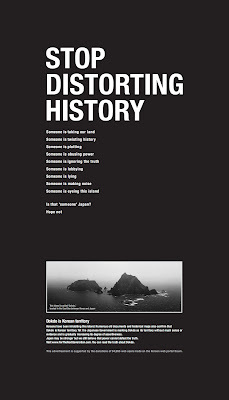 Its main title is "STOP DISTORTING HISTORY" and is supposed to catch readers' sights while reading the WP. It uses a repetitious word of 'someone' to help people remember the Ad longer. At the end, it introduces Seo Kyung-duk's website: www.forthenextgeneration.com to find more information about Dokdo-Takeshima conflict. Personally, I think that this ad appeals better in ways of expressing seriousness of the matter. I hope that one day, there is no need to fight over something that cannot be argued such as this dispute over Dokdo. All the historical documents prove that Dokdo is Korean territory. Japan should acknowledge this incontrovertible fact and act as the second largest of world's economy leading country.